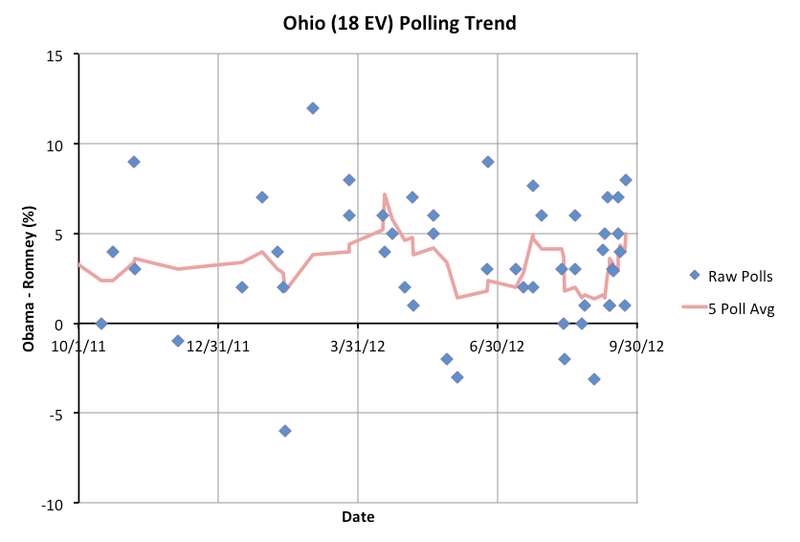 With the additions today, the five poll average in Ohio is an Obama lead of EXACTLY 5.0%. I define the “Weak Obama” category as 5% and above though, so this is enough to move the state to the new category. It is right on the edge though. The next day of polls could easily reverse this change. The trend in the last couple weeks has been the opposite, but this could change at any time. 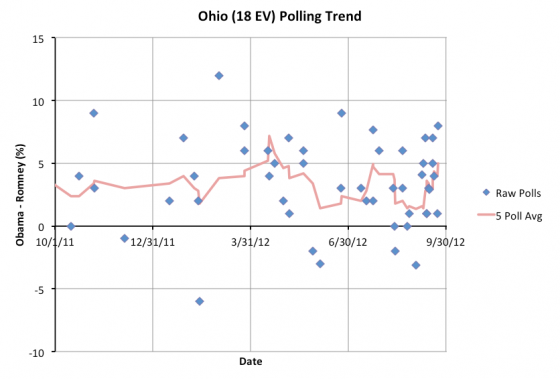 For the moment though, it looks like Ohio is moving away from Romney. Obama’s lead is now big enough that my models no longer include the possibility of Romney winning Ohio. 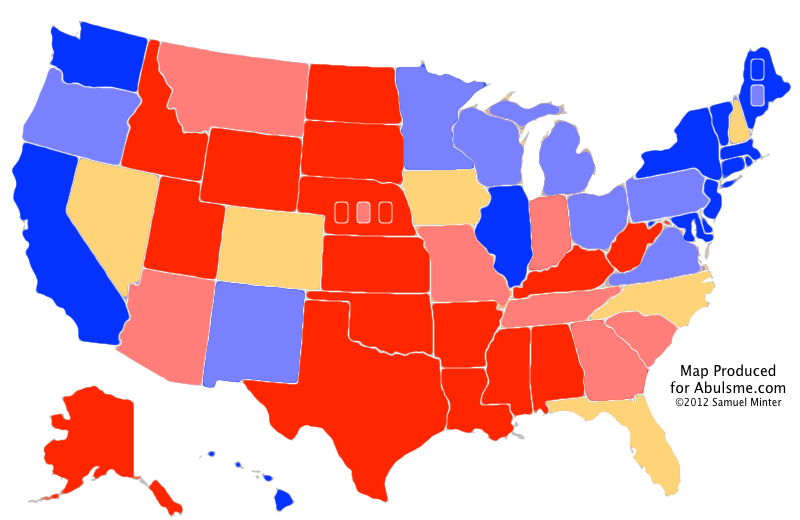 So, even if Romney wins EVERY CLOSE STATE (all of which he is currently behind in), he would still lose to Obama 260 to 278. Romney can win every state that is even remotely close, and it is still not enough. HE STILL LOSES. This is the 4th time this year that Romney’s “best case” has been this bad. In each of the previous cases, Romney has subsequently pulled back some of the states where Obama is ahead by more than 5% and made them somewhat competitive again. He hasn’t actually managed to pull enough of them over the line to his side to ever be in the lead in the electoral college, but he has at least managed to make enough states close that he could win if he swept those close states. So now of course the question is: Can he do it again? Can Romney fight back and make some more states close again? Pennsylvania (20), Ohio (18), Michigan (16), Virginia (13), Minnesota (10), Wisconsin (10), Oregon (7), New Mexico (5) and Maine’s 2nd Congressional District (1) are the areas where Obama’s lead is between 5% and 10%. Some of those are probably permanently out of reach. But perhaps Romney can make some of them into a battle again with a massive advertising blitz? Perhaps with the help of a few big stumbles by Obama? I don’t think it can happen without big stumbles by Obama. Romney stopping his tendency to put his foot in his mouth and starting to run a disciplined and competent campaign wouldn’t be enough. He needs Obama to screw up. And even then, can he get past making a few more states close to actually starting to take the lead in some of these states? Let alone enough of them to win the Presidency? It seems unlikely. 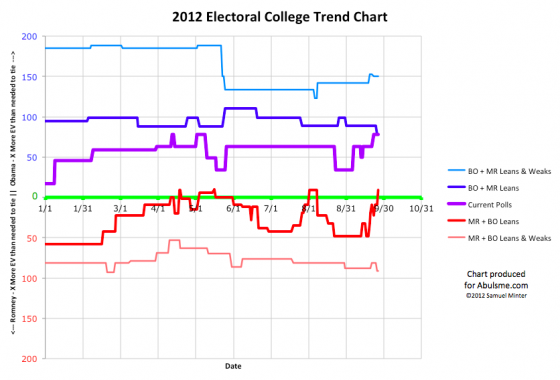 The scenarios that result in Romney catching up and winning seem more and more far fetched by the day. To be clear, a Romney win is NOT impossible. It could happen. It is just getting less and less likely as time goes on. Obama’s lead is increasing, and Romney is running out of time to catch up. First off, we still have the debates. Sometimes the debates can drive big changes they say. But everything I’ve been reading over the past couple months with regard to research on this subject says that debates very rarely move the polls any significant amount. Certainly not by a big enough amount to make up this kind of deficit. (Tales of a major reversal of fortune in the Carter/Reagan race after the final debate have been very effectively debunked by several people. It is basically an urban legend driven by looking at one set of polls while ignoring all the others.) Could Obama come out, have a nervous breakdown, start walking in circles and clucking like a chicken on live national television and thereby completely blow his lead? Well, yes, something of that magnitude could do it. But assuming a basically competent debate performance by Obama, even if Romney “wins” debates, it is hard to see them giving Romney the boost he would need to win. Second of all, more and more you hear the argument that the polls must be wrong. That there is a systematic pro-Democratic bias in the polls, and Romney is really doing much better than the polls would indicate, and because Republicans are more motivated, they will have higher turnout and therefore win. The only thing to say here is that as long as you are looking at poll averages and not any particular pollster, the house effects leaning one direction or another basically get averaged out. Also, for the most part even the pollsters that have a partisan alignment are actually motivated to structure their polls to produce results that match the actual outcomes in the end. Even a highly partisan pollster would try to correct a systematic bias in their results if they found one, because it translates into lower predictive value for their polls, which makes them less valuable. Finally, there is just the historical record. People who have convinced themselves that the polls just must be wrong have tended to be disappointed much more often than they’ve ended up being right. So how lopsided does this matchup need to look at this stage in the game to start just saying outright that absent an event of cosmic proportions the race is over and Obama will certainly win? We are very very close. It is tempting to just say so right now. But I will hold off a little bit. …OK, really, it is already very difficult to construct those scenarios. Can he make it closer than it looks today? Sure. Can he move things enough to actually win? That is looking pretty far fetched at the moment. I’ll hold off saying “it is over” for a couple weeks to give Romney a chance to figure out the miracle he needs. Maybe he’ll be able to find and execute on said miracle. Maybe.